Today, the Human Rights Campaign Foundation released its 10th edition of the Healthcare Equality Index (HEI), reflecting a decade of progress in LGBTQ-inclusive healthcare. A record 590 healthcare facilities actively participated in the 2017 HEI survey, committing to LGBTQ-inclusive policies and practices. In addition, the HRC Foundation proactively researched the key policies at more than 900 additional non-participating hospitals. Of facilities surveyed for the HEI, 303 earned HRC’s coveted “Leader in LGBTQ Healthcare Equality” designation. This year also marks the first time the HEI has awarded numerical scores -- and three quarters of the healthcare facilities actively participating in the survey scored 80 points or above. This year’s HEI highlights the groundbreaking work taking place at two transgender youth clinics -- GENECIS at Children’s Health in Dallas, and the Center for Child and Adolescent Gender Care at Duke Children’s Hospital in Durham, North Carolina. Legislative attacks on the transgender communities in both of those states underscore the importance of the care and affirmation these clinics are providing transgender youth. In Texas, SB6, a bill targeting transgender people’s access to public facilities, passed out of committee and is up for a vote by the full state senate. And in North Carolina, the negative effects of HB2, which, like SB6, targets the state’s transgender community for discrimination, continues to significantly damage North Carolina’s reputation and economy. In the 2017 report, an impressive 303 facilities -- 51 percent of those actively participating in the survey -- met this year’s more challenging criteria to earn the Leader designation. Another 144 facilities earned a “Top Performer” designation for scoring between 80 and 95 points. With three quarters of actively-participating facilities scoring 80 points or more, it is clear that healthcare facilities are going beyond the basics in adopting policies and practices in LGBTQ care. In addition to the positive scoring criteria, the 2017 HEI includes a fifth section focusing on responsible citizenship, and calling out activity that would undermine LGBTQ equality or inclusive patient care. Healthcare facilities may have 25 points deducted from their score for a large-scale official or public anti-LGBTQ blemish on their recent records. This year, Johns Hopkins Hospital became the first and only facility to receive this deduction. 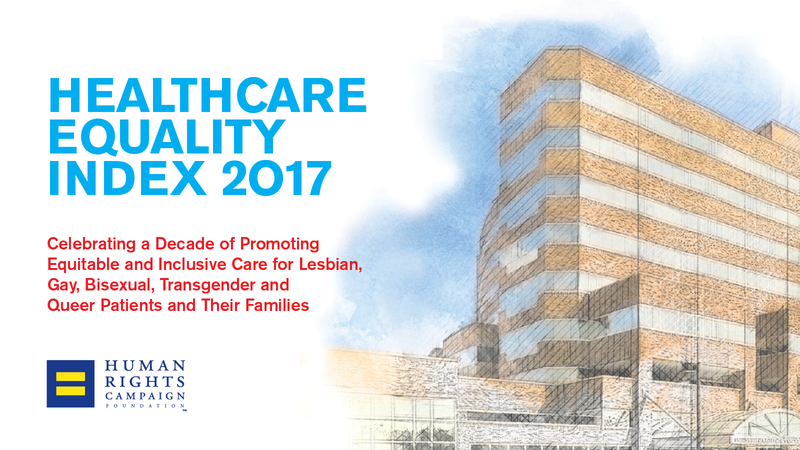 Of the hospitals who did not participate in the 2017 HEI but were scored based on HRC’s research, only 61 percent have nondiscrimination policies that include both “sexual orientation” and “gender identity,” and only 52 percent were found to have an LGBTQ-inclusive employment non-discrimination policy. However, 95 percent of these facilities are committed to equal visitation, close to the rate of the facilities that actively participated in the survey.